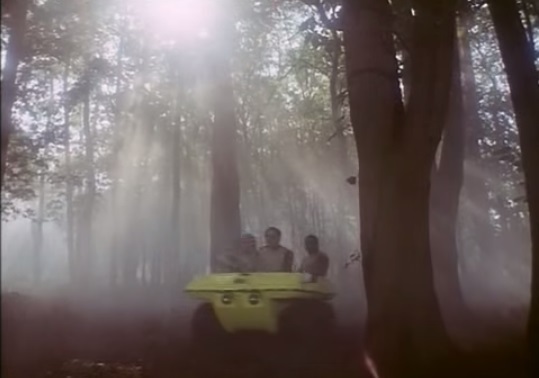 John Kenneth Muir's Reflections on Cult Movies and Classic TV: Breakaway Day 2018: "The Full Circle"
The reconnaissance team on Eagle 6 has not reported back from the forested planet of Retha. 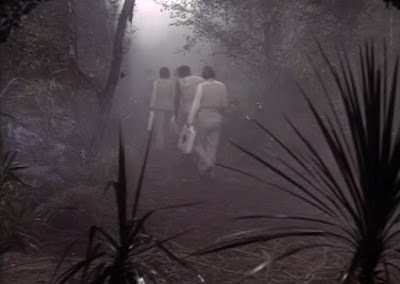 Commander Koenig (Martin Landau) orders Paul Morrow (Prentis Hancock) to retrieve the craft by remote control. When the ship is explored at Moonbase Alpha, a primitive cave-man is discovered dead in the passenger module. He is the ship's only occupant. Koenig orders a full-scale rescue mission to the planet, unaware that a mysterious mist found on the planet surface is actually a time warp of sorts. When the Alphans step through the fog, they are re-made as primitive cave-people. As a primitive man, Koenig becomes Cave Chief, while Helena Russell becomes the tribal healer, and the Chief’s consort. Unaware of what has happened to her fellow Alphans, data analyst Sandra Benes (Zienia Merton) encounters several cave people, who capture her and bring her back to the cave. There, a primitive hunter (Oliver Cotton) and the Cave Chief battle for ownership of the beautiful and strange female in their midst. On Alpha, Dr. Mathias (Anton Phillips) solves the alien riddle during an autopsy. The caveman in the Eagle has caps on his teeth. 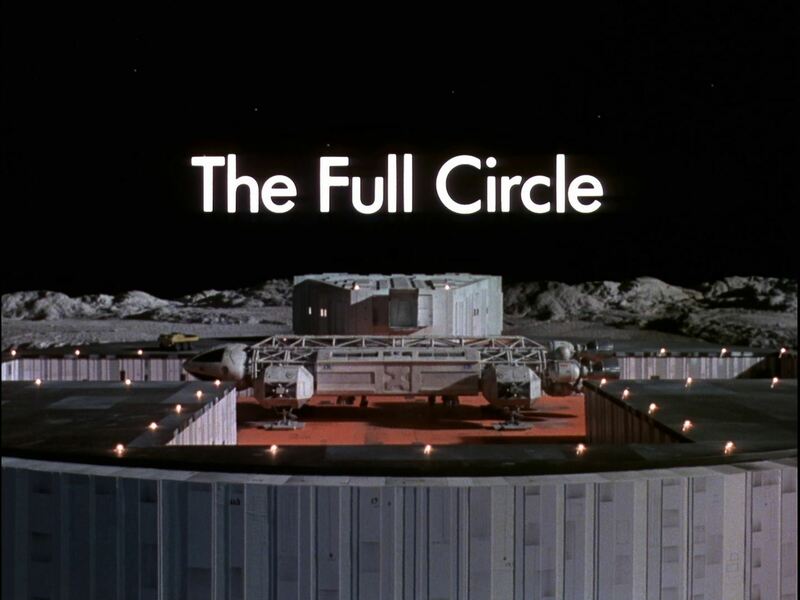 “The Full Circle” is likely not one of the better-regarded episodes of Space: 1999’s (1975-1977) Year One. And yet, it is an episode that I like very much, and for two key reasons. First, the episode is set mostly in natural, real environs, and that fact gives the story a remarkable boost in terms of visuals and excitement. The planet Retha is a combination of Black Park and Pinewood Studios back-lot exterior locations, and the contrast between sterile, technological Moonbase Alpha and such natural, wild locales is remarkable. You could not recreate the “primordial” look and feel of Retha on an interior sound-stage, using papier mache rocks, nor, truthfully, by using a familiar So Cal location. To American eyes, therefore, “The Full Circle” looks genuinely like a journey to the prehistoric era, to a wild, untamed world. 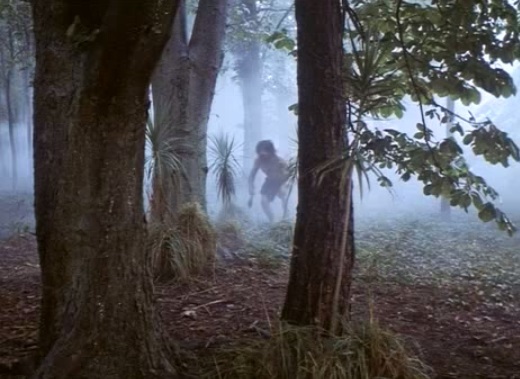 Director Bob Kellett’s camera-work is also remarkable, especially during the pursuit of Sandra by the cave-man Alphans. Secondly, the episode’s thematic framework works very successfully. Specifically, "The Full Circle" ponders the (unchanging?) nature of humanity. It compares turn-of-the-millennium, space-age Alphans to Stone Age counterparts, and finds few meaningful differences. To wit: Sandra Benes (Zienia Merton) nearly bludgeons Commander Koenig (as cave man) to death with a rock. And Alan Carter (Nick Tate) literally goes “cave-man,” vengeful and hungry for blood when he worries that Sandra has been injured. These are the acts of rational, modern human beings? As the episode’s coda suggests, the narrative is really about basic human emotions, about human instincts. Sandra still acts by fight-or-flight dictates, for example, and this means that she is not far removed, in terms of nature, from the Cave Chief who -- in a manner very unlike Commander Koenig -- desires her. As Koenig notes “it was only us there,” and the point is made. In 40,000 years, according to the episode’s timeline, man has not really evolved beyond savagery, beyond jealousy, rage, and other primitive emotions. Those things still drive us, sometimes to survival, sometimes to disaster. One scene suggests the similarities visually. 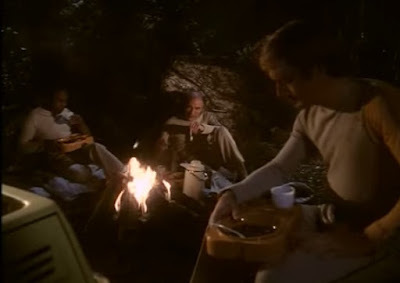 At around the half-way point of the episode, we meet Alan, Victor and Kano huddled around a camp-fire, getting ready to turn in for the night. 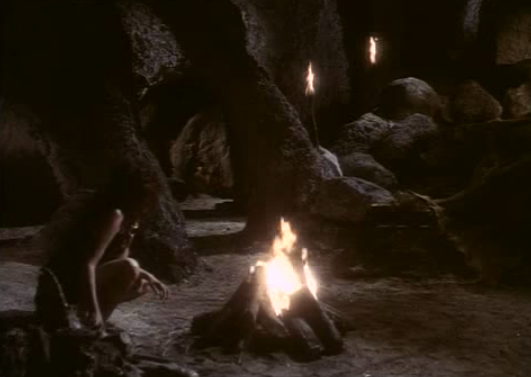 In the very next scene, we see the interior of the tribe’s cave, where a camp-fire is also at the center of the population, at the center of civilization. The costumes have changed -- from Rudi Gernreich 1999 chic to primitive furs -- but man has not. He still needs fire. He still huddles with his fellow humans in the dark. And he still doesn’t understand all the mysteries of nature, and the universe. Where “The Full Circle” vexes some critics and viewers, I suppose, is in the story mechanism that makes the comparison between primitive man and space age man possible. Here, a swirling mist is a time warp that changes Koenig, Helena and other Alphans from civilized to primitive. Even their clothes change with them. The time warp mist is a solid device for making the story’s point, but leaves a lot of questions unanswered. How do the Alphan’s change costumes in the mist? How does the time warp achieve that end? Does all the mist on the planet act in this fashion, or only in this one spot? Is the time warp naturally occurring, a function of “nature” on Retha, or is it something that was designed by unseen inhabitants? 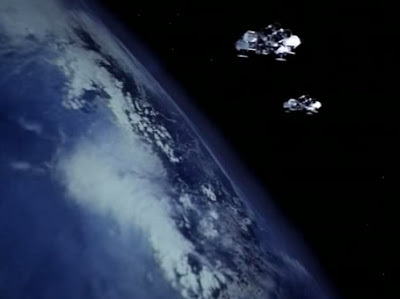 Personally, it doesn’t bother me that Space: 1999 fails to address such questions. I prefer to speculate, and have always felt that the time warp is some device or entity left behind the planet’s inhabitants. Perhaps they created it because they foresaw the end of their race, and wanted to go back to the beginning...get a second chance. Or perhaps they left it behind on Retha to preserve the planet’s natural, unspoiled nature. Any visitors would lose the capacity to alter the planet’s climate or terrain if reverted to primitive form. In the end, the details don’t really matter a whole lot, and it is what “The Full Circle” states about human nature that is valuable, and memorable. 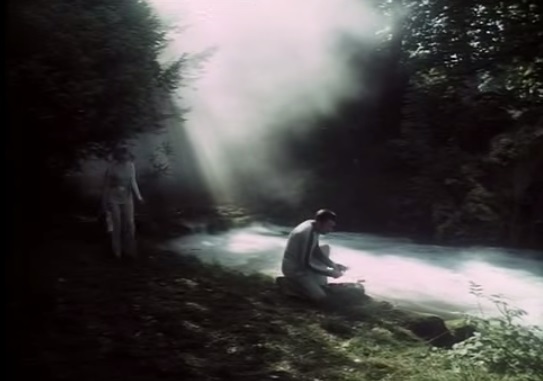 When you combine that statement with the beautiful location work, the episode emerges as one that is less disposable, and far more intriguing. Barry Gray's score is also one of his most unusual contributions, and underlines the action brilliantly. Also, as is the case in many Year One stories (and “Earthbound’s” coda is an example), “The Full Circle” gains interest and suspense from a twist in the tale. It is learned, late in the story, that the cave-man in Eagle 6 is actually an Alphan. Specifically, he has caps on his teeth. This information changes the whole nature of the story on the first watch. Before this reveal, it is a natural assumption that the Alphans have encountered a world of primitive man. In fact, as Mathias's discovery suggests, they have encountered only themselves at a different stage of development. That twist is a surprising one, and like the device of the misty time-warp, makes the final point about humanity’s unchanging nature, all the more powerful.